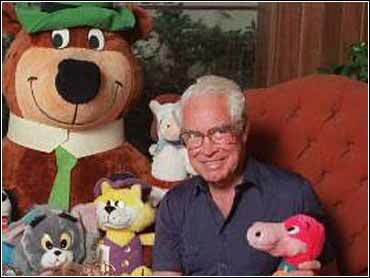 Animation pioneer William Hanna, who with partner Joseph Barbera created such beloved cartoon characters as Fred Flintstone, Yogi Bear and Tom and Jerry, died Thursday. He was 90. Hanna died at his North Hollywood home with Violet, his wife of 65 years, at his side, said Sarah Carragher, a spokeswoman for Warner Bros., which owns Hanna-Barbera Studios. She said he had been in declining health for the last few years. Hanna and Barbera collaborated for more than a half-century, first teaming up when both worked at MGM in 1937. They created the highly successful Tom and Jerry cartoons, the antics of a cat and mouse team that won seven Academy Awards, more than any other series with the same characters. They broke new ground by mixing Tom and Jerry with live action stars such as Gene Kelly in Anchors Aweigh and Esther Williams in Dangerous When Wet. They formed their own animation company Hanna-Barbera in 1957 after the phone rang and they were told that the animation division at MGM was being shut. "You have to realize that two guys who worked for 20 years on Tom and Jerry and had won every award including seven Oscars could not understand why the phone rang and a voice said 'Close the studio,' " Barbera, who is 89, said in an interview with the Los Angeles Times last year. He added, "There was no warning. It was just close the studio. We were the best in the business and what were we going to do now? Sell hamburgers?" Instead, the two turned to television and a created a simpler and less expensive form of animation made especially for the small screen, highlighted by The Flintstones, The Jetsons and Yogi Bear. Huckleberry Hound and Friends won the first Emmy Award given to an animated series. Ultimately they produced 3,000 half-hour shows creating such characters as Huckleberry Hound, Scooby-Doo, the Jetsons, Atom Ant, Jonny Quest, Quick Draw McGraw, Top Cat, Magilla Gorilla, Pixie and Dixie and Josie and the Pussycats. Their strengths melded perfectly, critic Leonard Maltin wrote in his book Of Mice and Magic: A History of American Animated Cartoons. In a medium where the best work combined unforgettable characters and funny situations, Hanna brought cuteness, warmth and a keen sense of timing, while Barbera supplied the comic gags and skilled drawing. "This writing-directing team may hold a record for producing consistently superior cartoons using the same characters year after year without a break or change in routine," Maltin wrote. Hanna was born in Melrose, N.M., on July 14, 1910. He left college to work as a construction engineer, but lost the job in the Depression. He found work with Leon Schlesinger, head of Pacific Art and Title, a cartoon production company. In 1930, Hanna signed with Harmon-Ising Studios, the company that created the Looney Tunes and Merrie Melodies cartoon series, here he worked as a member of the story department, as a lyricist and a composer. One month after being hired at MGM, he formed his partnership with Barbera. Hanna said "I was never a good artist," but he said Barbera "has the ability to capture mood and expression in a quick sketch better than anyone I've ever known." The two first teamed cat and mouse in the short Puss Gets the Boot. When it was a hit with audiences and got an Oscar nomination, MGM let the pair keep experimenting with the cat and mouse theme, and the full-fledged Tom and Jerry characters  almost always telling the story entirely in action, not dialogue  were the result. Like The Simpsons three decades later, The Flintstones found success in prime-time TV by not limiting its reach to children. It ranked in the top 20 shows in the 1960-61 season and Fred Flintstone's "yabba dabba doo" soon entered the language. "You can read a lot into it," Hanna once said. "You can compare Fred and Barney Rubble with Gleason and Carney." The Jetsons, which debuted in 1962, were the futuristic mirror image of the Flintstones. "Somebody said, 'What's next?' and we went from the rock era into the future," Barbera said at a celebration when the show turned 25 in 1987. "It wasn't that brilliant, really, but we used a lot of gimmicks and gadgets and it worked." Hanna-Barbera received eight Emmys, including the Governors Award of the Academy of Television Arts & Sciences presented in 1988.